There is yet another free MP3 credit deal for Amazon. This one requires use of Facebook. You have to post a comment from the page to your Facebook account. and we learn even nations can't escape debt collectors. In 2010 the worlds total manufacturing output was about $12 trillion. The US and China accounted for about a 3rd of total manufacturing. 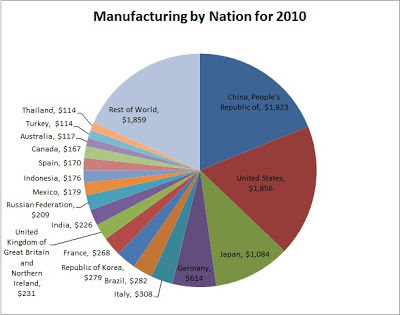 Here is a pie chart showing the worlds manufacturing as split by nation. Note that China only recently passed the USA in this measure. For 110 years the US was the worlds leading manufacturer. Still our $1.8T in manufacturing output is nothing to sneeze at. I pulled the data from United Nations site. Note that this is just manufacturing and does not include mining or agriculture. Also this doesn't show the amount of imports or exports either. 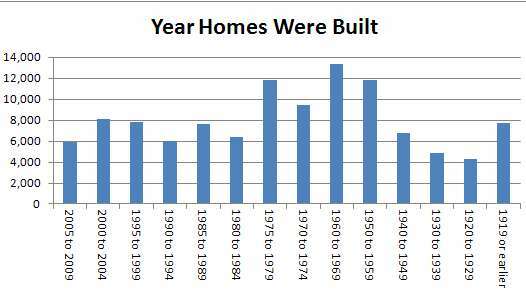 Here is the data in chart format. Figures are in billions of US dollars. 18 nations listed produce $100 billion or more of manufacturing and add up to about 85% of the worlds total. We used to have ADT for our home security since my wife had signed up with them when she was single. Finally we got out of their multi-year contract and we were happy to be rid of it. After seeing some positive reviews on the net and doing some comparison shopping I decided to go with SimpliSafe for our new home alarm. So a few months ago I bought and installed a SimpliSafe2 home alarm system. The SimpliSafe system is a simple wireless based do-it-yourself home installation with no contract commitment. The basic alarm monitoring costs just $14.99 per month. The alarm is monitored with police dispatch. They use a cellular wireless signal so you don't have to have it connected to your home phone or even need a home phone. This is a nice feature for us since with the ADT system we were stuck having a landline because the alarm system required a home phone to dial out on. While companies like ADT often offer free hardware installation, you do have to pay to buy your hardware from SimpliSafe. However its reasonably priced. I opted for the SimpliSafe2 system since it has more features like freeze and water alarm and plans for fire and carbon monoxide alarm. The total cost I paid for our system was $463.55 That included the SimpliSafe2, 3 door sensors, 2 motion sensors, panic alarm, 2 keychains and a yard sign. The monthly monitoring cost for SimpliSafe starts at only $14.99 compared to the $42 and change that we were paying for ADT. ADT quickly gets the money from the free hardware back by charging you significantly more for monthly service and locking you into a 3 year contract. If you compare a basic SimpliSafe configuration with ADT you'll save hundreds of dollars over a three year period. Thats an apples to apples comparison of features from ADT and SimpliSafe. You can spend more with SimpliSafe if you want more features. The SMS text monitoring service is an extra $5 per month and advanced online monitoring and other monitoring will be $25 total, but our ADT system didn't offer those features. The installation was very easy and the monitors simply stick on the walls. When you turn on the base station it has voice commands that tell you what to do. SimpliSafe's site has a 5 minute video showing the installation. It is really simple to install and get setup and you can do it in a matter of minutes. I did have some initial glitches getting the system to be recognized by SimpliSafe and I decided to hoook the unit to our home phone. Unfortunately our home has very poor and undependable cellular signal and I think that is likely the cause of the problem we had, though I'm not certain. I also have to say that one time my wife accidentally triggered the alarm and it didn't seem to call the police. We're not sure why that happened. I don't know if my wife ever found the time to call the SimpliSafe people to follow up and try and figure out what happened. One of the negatives I found with SimpliSafe is that their actual phone support has pretty limited hours of just Monday - Friday 9AM to 6PM EST. Thats not convenient and not very good as far as I'm concerned. I can't take off time from work to troubleshoot the thing and I went in assuming they'd have basically 24/7 phone support, but I assumed wrong. Of course the monitoring system is 24/7 but if you need technical support then they are limited to bankers hours. Here is a YouTube review which shows the actual hardware as it comes in the box. Another Youtube video shows some home installation. Overall I would recommend SimpliSafe as I think the glitches we've seen are the exception to the rule and its a great value. 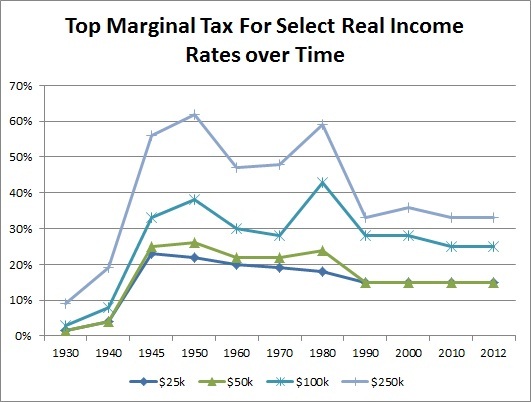 The top marginal income taxes used to be a lot higher. During WWII the top marginal rate in the USA was 94%. Today the top marginal tax rate is 35%. However to hit that top 94% rate in 1945 you'd have to make $200,000 taxable income which is equivalent about $2,500,000 in todays dollars. Only the very rich were paying that kind of tax rate back then. For most of us taxable income of $25,000 to $250,000 range is more common. So to get a better comparison of marginal tax rates over the years lets look at the top marginal tax rate at inflation adjusted rates for incomes in that range. I'm looking at just the taxable income for a married couple. I got the historical marginal rates from the Tax Foundation, for recent tax rates I used the tax brackets at moneychip site and I adjusted the figures for inflation with the BLS inflation calculator. As you can see theres less variation in the marginal rate for the lower/middle income groups. 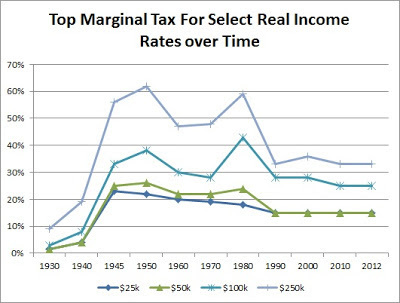 For inflation adjusted income levels of $25,000 or $50,000 the marginal rate has varied from 20-26% in the 40's to 60's down to 15% for the past couple decades. The higher income group with >$250k of taxable income has seen rates vary a lot more. In the 50's their marginal rate was 62% and today its down to 33%. Before WWII the income tax rates were much lower all across the board. Keep in mind that I am ignoring deductions and exemptions which would of course impact all this as well. GetRichSlowly hosts a readers perspective on Being a landlord: Is it worth it? Ever hear of anyone you know complain of paying the AMT or Alternative Minimum Tax? If you live in New Jersey or Connecticut you're more likely to have heard such complaints than if you live in Tennessee or South Dakota. Nationally 2.7% of the population paid AMT in 2009 but the rate varies a lot between states. This is data from the IRS for the year 2009. Its from the SOI tax stats tables by states. I'm using the 2009 figures since those were the latest that showed AMT. As you can see theres a pretty wide variation in the percentages from state to state. Most of the difference in ATM rates between states is due to differences in income levels from state to state. The highest rate is in New Jersey where nearly 20% of the tax filers reports household income over $100,000. While the lowest is Tennessee at 1.0% where just under 9% of the households are in the six figure range. Yet another $2 MP3 credit at Amazon. You do have to post on Facebook to get the $2 credit. Promotional credits must be redeemed by 11:59 p.m. PST on October 23, 2012. I wonder how many Americans realize we are the wealthiest nation in the world by a wide margin? The way people seem to talk in the US you'd think we were all broke or close to it. Of course our nations wealth isn't in the hands of most of the citizens but as a nation our wealth far exceeds any other nation in the world by a wide margin. 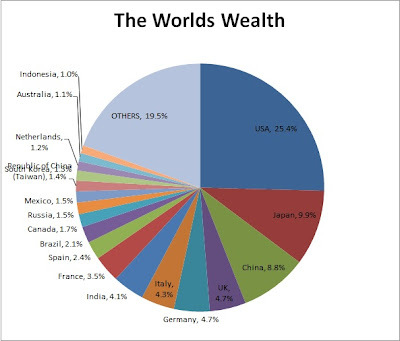 Wikipedia has a list of countries by distribution of wealth and there they show the % of the worlds wealth held by each nation. The US holds about 2.5 as much wealth as #2 Japan. We're #1 by a wide margin. Also notable is the fact that just 5 nations control over half the worlds wealth : USA, Japan, China, UK and Germany. The 18 countries that hold 1% or more of the money have 80% of the total. Next time you or someone you know acts as if our nation is broke, think again.